Awards: Good Conduct Medal, Vietnam Service Ribbon, Cross of Gallantry with Silver Star, Air Medal with 11 OLC, Purple Heart, Bronze Star, Silver Star, Combat Infantry Badge. Civilian/Military Schools: Airborne and Ranger School, Ranger Instructor Training, Professional Training in Real Estate Sales. Wife’s Name: Patricia (32 Years); Children 2; Grandchildren 4. Summary of Assignments: Immediately after graduation in 1966, I went through Jump School and Ranger School. I stayed with the Ranger Department as cadre at the Benning phase. In September, I was sent to Vietnam and was assigned to the 25th Infantry Division at Cu Chi, about 40 miles northeast of Saigon in War Zone C. My first assignment was with the 2nd of the 27th Infantry Wolfhounds where I had the first platoon in A company. In December, I took over Battalion Recon and was used as the fourth company. 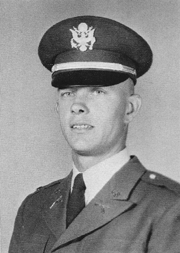 In February of ’67, I became the Aide-de-Camp to the new Assistant Division Commander, BG Edward Flannigan. Two months later we moved into Westmoreland’s Villa in Saigon. General Flannigan had become the Special Assistant to General Westmorland and it turned out that my only job was to set out the name tags for the evening meal. At my request, I left the next day and went back to the 25th Division and took over the job of Aide-de-Camp to the other ADC, General Don Bolton. I finished out my tour flying every day with General Bolton. I also wrote up my company commander and one of my squad leaders for the Medal of Honor and they both received it for their actions in a fight we had on 5th November, 1966. I attended the ceremony where they were presented with their medals by President Lyndon Johnson. On my return to the United States, I finished out my active duty at Fort Ord, where I opened the new Monterey Peninsula Military Museum. Jobs/Profession following military: When I was released from active duty I returned to my hometown of Mill Valley, California, which lies just a few miles north of the Golden Gate Bridge. I obtained my Real Estate Brokers License and went to work for the largest Real Estate Company in the area, were I managed the Southern Marin office. I was President of the Mill Valley Jaycees, President of the Mill Valley Chamber of Commerce, President of the Mill Valley Rotary and President of the Marin County Board of Realtors. I served on the ‘71-‘72 Marin County Grand Jury where we deliberated the fate of Angela Davis and the San Quentin Six. In 1980 I took a compete 180 and decided on an early retirement, dropping out of all the organizations with which I had been so completely involved. In 2001 my wife and I bought a home in the California Gold Country. We live about 40 miles north of Sacramento in Nevada City which is located in the Sierra foothills. Patricia, my wife of 32 years, and I have become very involved in the community. Vietnam Veterans are made to feel particularly welcome in this community and their enthusiasm is shown by the reception given to our group when we lead the numerous parades during the year. I am very active in the Vietnam Veterans, Chapter 535, and was their President for two years. We support five Montagnard Orphanages in the central highlands of Vietnam and several members go back there every year. We also send care packages every month to local military serving in Iraq and Afghanistan. Current hobbies/interests: My favorite hobby is riding motorcycles of which I have four. My latest acquisition is a Honda Gold Wing Trike. 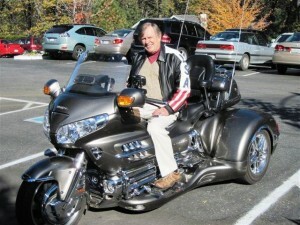 I am still able to manage a few long trips a year including a very memorable ride to Sturgis.